Why Ghee Is The Ayurvedic Superfood? Ghee, also known as clarified butter is prepared by boiling the butter and removing the milk solids leaving a concentrated residue of butterfat. Ghee is packed with vitamins A, D, E and K, as well as fatty acids CLA and butyric acid, leading to some great health benefits. Ghee is rich in healthy fat-soluble vitamins such as vitamins A, D, E, and K. These vitamins are essential for overall health. One tablespoon of ghee can provide approximately 15% of daily requirements of vitamin A.
Ghee not only helps to break down food matter, but also increase the ability of the intestinal wall to absorb vital nutrients. Ghee is rich in omega-3 fatty acids, which lower unhealthy cholesterol levels and boost heart health. Ghee contains the butyric acid which improves immunity by increasing the production of T cells in the gut. Ghee also harbors phenolic antioxidants that support normal functioning of the immune system. Butyric acid in Ghee also promotes better digestion. Butyric acid is a short-chain fatty acid that nourishes the cells of the intestines. Butyric acid helps heal the digestive tract and keeps it healthy. Ghee is also much easier to digest than butter or vegetable oils. Ghee contains medium chain fatty acids which the liver can absorb directly and burn immediately, making it a healthier source of energy than most of the carbs we eat daily. Ghee is a often used in Ayurveda as a moisturising agent for relieving skin dryness. 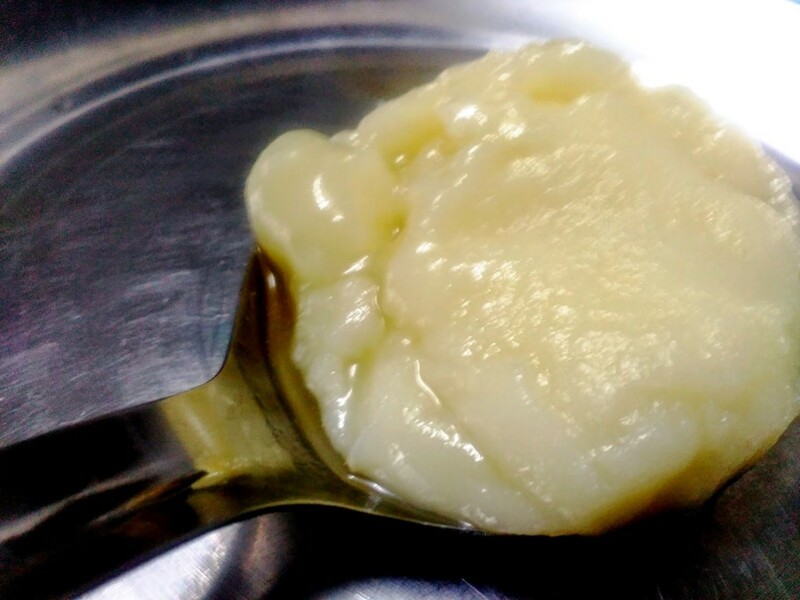 Ghee has the ability to nourish and lubricate the tissues on a cellular level. Ghee is rich in conjugated linoleic acid (CLA), a fatty acid that protects against plaque, cancer and diabetes. Ghee also help support the body’s normal detoxification process. According to a study published in the Indian Journal of Medical Research, ghee increases the availability of enzymes responsible for eliminating harmful substances. Unlike butter, ghee can be stored for extended periods without refrigeration. If stored in an air tight container, ghee can last up to 3-6 months. Next post: How to Recognize A Heart Attack One Month Before It Happens!